Recommended for dry or maturing skin. Cleanse - tone - moisturise - nourish. Martha's best selling range for over 20 years. 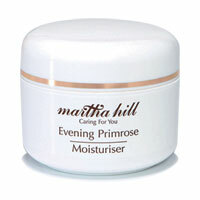 Martha Hill's Evening Primrose Skin Care Range is the perfect choice for dry or maturing complexions. The four products provide everything you need for daily skin care. You will soon notice your skin becomes firmer, resulting in a smooth, supple skin. The texture of your complexion will be refined, reducing the risk of premature lines. Regular use may also help to reduce sensitivity and soothe minor skin irritations. Suitable for complexions that are: dry; maturing; prone to eczema. One of the common names for Evening Primrose is "kings cure all", and this name reflects the wide range of healing powers ascribed to this plant. The oil is extracted from the seeds and is rich in GLA (gamma linoleic acid). It has been shown to have anti-aging, antioxidant properties and also acts as an anti-inflammatory, helping to reduce redness and discolouration. Research suggests that the oil may help in treating skin disorders like eczema, adult acne, etc.